Barbecue’s golden age? That would be when such barbecue legends as Charlie Vergos grilled ribs in Memphis, Arthur Bryant smoked burnt edges in Kansas City, and Big Bob Gibson slathered chicken with white barbecue sauce in Decatur, Alabama. But if you’re waiting for me to complain that barbecue just isn’t what it used to be, guess again. It’s better. A new generation of pit masters, like Tim Rattray in San Antonio or Hugh Mangum in Manhattan, has taken over. 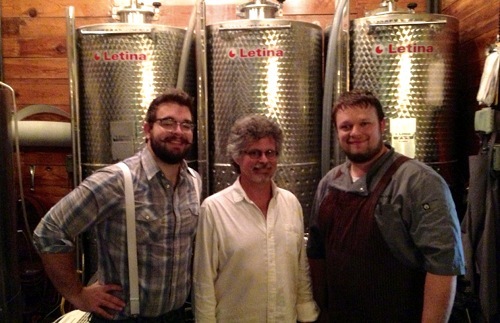 Only now, they’re cooking with heritage pork, grass-fed beef, and organic or natural chicken. They respect tradition to a point (consider Aaron Franklin’s textbook brisket). But they’re also broadening our notion of what traditional barbecue is to include lamb and goat, salmon and shrimp (wild when possible), even artichokes, corn, and tofu. The good old days may be gone. The future looks even better. 2013 was an incredible year for barbecuing and grilling. Here’s my list of top 10 restaurants for 2013. Hometown Bar-B-Que (Brooklyn, New York): When Billy Durney was a bodyguard, he survived stalkers of his A-list movie stars. 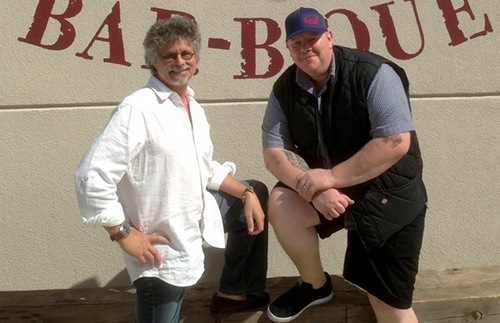 So when Hurricane Sandy dumped six feet of sand and water in his about-to-be-opened barbecue restaurant, Hometown Bar-B-Que in Brooklyn’s Red Hook neighborhood, he rolled up his sleeves and cleaned out and re-fired his Lang and Old Hickory smokers. 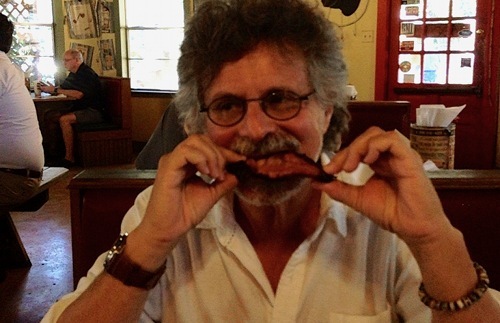 Durney knows when to follow tradition (just taste his classic brisket and pork shoulder) and when to forsake it. His Jamaican-style jerk chicken would do a Rastafarian proud. His smoked lamb belly banh mi (Vietnamese-style sandwich) will leave you speechless. Chi Spacca (Los Angeles): This homey 30-seat grill parlor—the latest in an Italian restaurant empire by Nancy Silverton, Mario Batali, and Joe Bastianich and masterfully run by chef Chad Colby—may be the smallest steakhouse in North America, but everything it serves is bigger than life: a 42-ounce tomahawk pork chop that includes the entire rib bone and pork belly, or a costata alla fiorentina (Florentine steak) that’s 5 inches wide and tips the scale at 50 ounces. (Definitely made for sharing.) Meats are grilled over an almond wood-burning grill, but don’t miss the crackling crisp foccacia di Recco or butter- and cream-blasted mashed potatoes. Imperial (Portland, Oregon): The first thing that hits you when you check into Hotel Lucia, home of the new Imperial restaurant, is the intoxicating aroma of wood smoke. The second is the comforting knowledge that you can breakfast on home-smoked pastrami hash, lunch on wood-grilled romaine lettuce salad, and dine on secreto (a butcher’s steak cut from the hog’s underbelly) grilled and served on a wine barrel stave. The brainchild of Portland culinary legend Vitaly Paley, the Imperial is Portlandia at its best, complete with chandeliers welded from bicycle chains. Mighty Quinn’s Barbeque (New York City): The American dream is alive and well in Manhattan. Just ask Hugh Mangum, a former Wallflowers drummer who parlayed a food stand at Brooklyn’s Smorgasburg into an upscale barbecue emporium in the West Village, where the oak-smoked brisket comes so juicy it oozes, and each “Brontosaurus” (beef) rib weighs more than 1 pound. Don’t miss the edamame and sweet pea salad (at a barbecue joint?!) and homemade pickles. A new Mighty Quinn’s is slated to open in Brookfield Place in lower Manhattan in 2014. The Granary (San Antonio, Texas): This isn’t your typical Texas barbecue joint, not with grilled lamb shoulder served with sweet pea pudding and smoked heirloom tomato salad topped with avocado ice cream. Not where the smoky brisket comes in ramen soup and the shoulder clod is accompanied with crispy quinoa. Chef Tim Rattray and his brewmeister brother Alex (all beers brewed on the premises) set up shop in an old cooper’s cottage in San Antonio’s Pearl District and their modernist approach stands traditional Texas barbecue on its head. Ox (Portland, Oregon): If barbecue is a religion, Ox is its holy tabernacle, with a blazing Grillworks Dual 48 Architectural grill dominating the dining room like an altar. 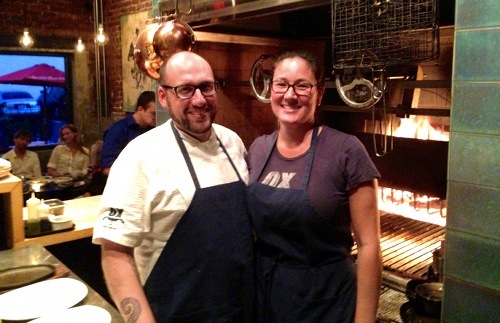 Greg Denton (he’s the guy with the octopus tattoo) and his Ecuadorian wife Gabi have loaded the menu with South American classics, such as smoked lemon pisco sours, Uruguayan grass-fed skirt steak, and a stunning grilled lamb heart herb salad—a riff on Peruvian anticuchos. Halibut comes in bible-thick steaks on the bone, while mammoth artichokes are roasted directly on the embers. And because this is Portland, you don’t have to ask if the grilled beef short rib, maple-brined pork loin chop, or housemade morcilla (blood sausage) are humanely raised or locally sourced. Of course they are. Pig & Pickle (Scottsdale, Arizona): No, it’s not a barbecue joint (they use a portable Southern Pride smoker on wheels), and they don’t have a wood-burning grill, but to come to Scottsdale and miss the smoked butter with slow-fermented bread, citrus-smoked salmon, house-smoked tasso ham, and smoked pot roast sandwich, would be like traveling to Agra and skipping the Taj Mahal. Craft cocktails. Check. 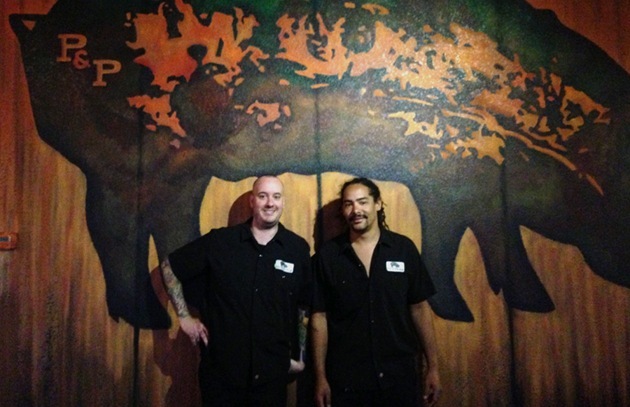 (“We don’t serve mainstream beers or have a bar gun,” says co-owner chef Keenan Bosworth.) Homemade pickles. Check. An industrial dining room complete with exposed HVAC ducts and polished concrete floors. Fette Sau (Brooklyn and Philadelphia): Musicologist turned restaurateur Joe Carroll didn’t set out to launch a food revolution when he opened Fette Sau (“Fat Pig” literally) in a dilapidated Williamsburg garage in 2007. But his St. Louis ribs, supernaturally moist pork belly, and well-curated whisky collection quickly brought standing-room-only crowds. The pastrami cures for 30 days, prior to being crusted with coriander and pepper and smoked for 14 hours. Carroll recently teamed up with Philadelphia restaurateur Stephen Starr to open a Fette Sau in the Northern Liberties district. Two Bros. BBQ Market (San Antonio, Texas): The coolest thing at this funky San Antonio barbecue joint is what you can’t see: an open air kitchen behind the restaurant with a competition-quality collection of brick and steel barbecue pits, each obsidian black with accumulated years of wood smoke. So you’ll have to be content with heaping platters of exemplary Texas brisket, cherry-glazed baby backs, uncommonly moist turkey breast, and bacon-wrapped jalapeno poppers—each perfumed with wood smoke and tender enough to cut with the side of a fork. Franklin Barbecue (Austin, Texas): It’s 8:30 a.m. and they’re lined up already—Austin barbecue addicts who endure triple digit temperatures and 2-1/2 hour waits for what is arguably the best brisket in North America. (Doesn’t anyone in Austin work?) The bare bones cinderblock dining room isn’t much to look at, but since you’ve waited this long, don’t miss the astonishingly succulent spare ribs, smoked turkey that’s as rich as ham, monster beef ribs (smoked for 8 hours and available only on Saturday), and pulled pork shoulder that could pass for authentic in North Carolina. Charlie Trotter’s (Chicago, Illinois—closed): This addition to the list was too important to leave off. Charlie Trotter’s was the opposite of a barbecue joint (it was an ultra-refined, Michelin-starred, French-inspired restaurant). It closed in 2012 and its founder died on November 5, 2013, at the tragically young age of 54. But it did have a wood-burning grill on which Charlie insisted on cooking his meats, varying the woods from oak for wild game in the winter to lighter cherry and apple for poultry and seafood in summer. Charlie was revered for his creativity and cerebral approach to cooking, but I will always remember him for his warm and generous spirit. When The Barbecue! Bible came out, Charlie insisted on hosting the Chicago press party. Thank you, Charlie—wherever you are, we miss you. 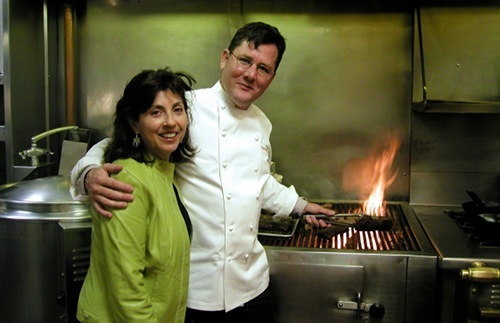 Steven’s wife, Barbara, with Charlie Trotter. 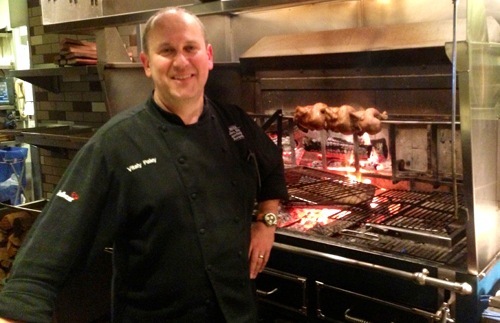 Just in time for 2014, we’re announcing our new Barbecue! Bible Wiki. The goal is to make it nothing less than the world’s most comprehensive encyclopedia of barbecuing, smoking, and grilling terms. This is a community effort so we need your help. Add to the lexicon with your own barbecue and grilling knowledge.